15 [So Pilate, anxious to please the crowd, released Barabbas to them.] He ordered Jesus flogged with a lead-tipped whip, then turned him over to the Roman soldiers to crucify him. Strong sunlight coming from the east (right hand side) lights this scene. In the background, from left to right: a Roman soldier in leather & metal armour, a Hebrew onlooker, 2 Leading priests (with heads covered in pale cloth), a man in green robes & a woman in blue robes, crying. 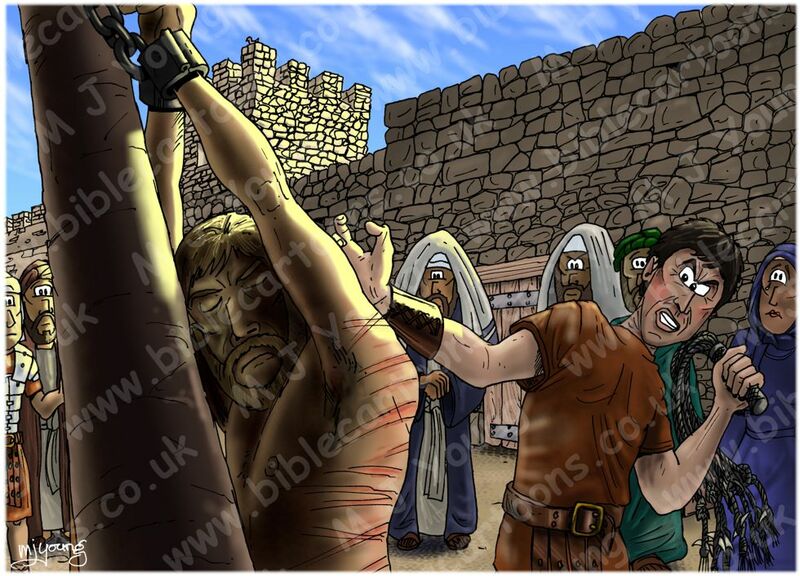 This was quite a harrowing scene to draw & colour, showing Jesus being flogged by a Roman soldier. Jesus has his eyes shut, enduring the agony of the whip, whilst the soldier looks angry & determined, as he beats Jesus. I decided to make the Leading priests’ faces show a kind of morbid fascination, since it was they who plotted to have Jesus arrested & persuaded Pontius Pilate to crucify Jesus. The other characters have mixed expressions of sorrow, neutrality or resignation. From a design perspective, I was pleased with the way the strong yellow lighting that comes from the rising sun (on the right of the scene) highlights & focuses the viewers attention on Jesus & the Roman soldier in the foreground of the scene. The flogging Jesus received could have killed him. The usual procedure was to bare the upper half of the victim’s body and tie his hands to a pillar before whipping him with a lead-tipped whip. The whip was made of leather thongs that connected pieces of bone and metal like a chain. The continued lashing with these sharp instruments tore at the victim’s skin, even baring the bones. 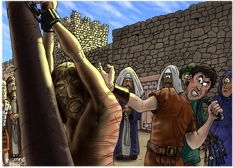 This torture by flogging always would precede execution; thus, Jesus was flogged before he was sent to the cross. 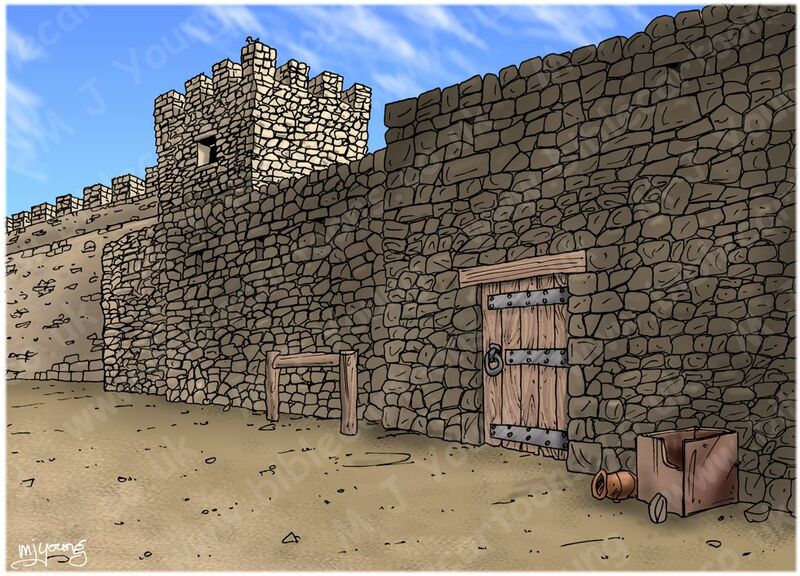 The Romans did it to weaken the prisoner so he would die more quickly on the cross.